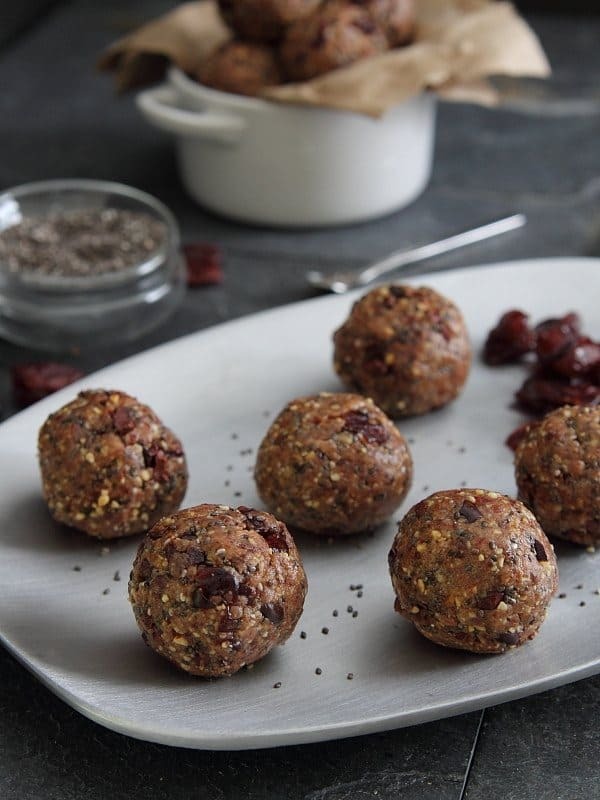 These chia cherry crunch bites are a high protein, gluten & grain free, paleo snack perfect for fueling up before or after your workout. You know that saying that you can’t out exercise a bad diet. Well guess what? It’s true. In theory, I know this. In reality, I’ve been eating far too much crap lately and *thinking* working out will make up for it. News flash: it doesn’t. I could blame all the freelance work I’ve been doing and the fact that the pitches that get chosen aren’t always the healthy stuff (because that’s precisely what’s happening) but blame really gets you nowhere. So I’m focusing on what I need to do to change things instead. 1. Get over my “throwing food out is a sin” mentality and seriously just throw the sugary, carb laden concoctions in the garbage. This is a job and should be treated as such. 2. Start keeping healthier stuff on hand so the sugary, carb laden concoctions aren’t the only option. I used to do #2 all the time and then this funny thing happened where I started cooking even more and yet I have less of the stuff I actually should be eating on hand. Oh, the irony. One of the most trying times of the day for me to eat well is the late afternoon, an hour or two before I usually work out. The dreariness of winter doesn’t help because all I seem to want is a mug of tea and something sweet. Lately, that’s meant spoonfuls of Nutella, nibbles of Guinness brownies, leftover Godiva chocolates from Christmas, or handfuls from the bag of M&Ms I found lurking in the back of the pantry after cleaning it out the other day. Not the best health choices and definitely not the best workout fuel that’s for sure. Which brings us to the balls. Sugar, chocolate and empty carbohydrates do nothing to make me feel satisfied or properly fueled for an intense workout. What does? A grain and gluten free protein, nut, seed and carbohydrate mix. And balls (or I guess we can be a little more mature and call these “bites”) are the perfect answer. 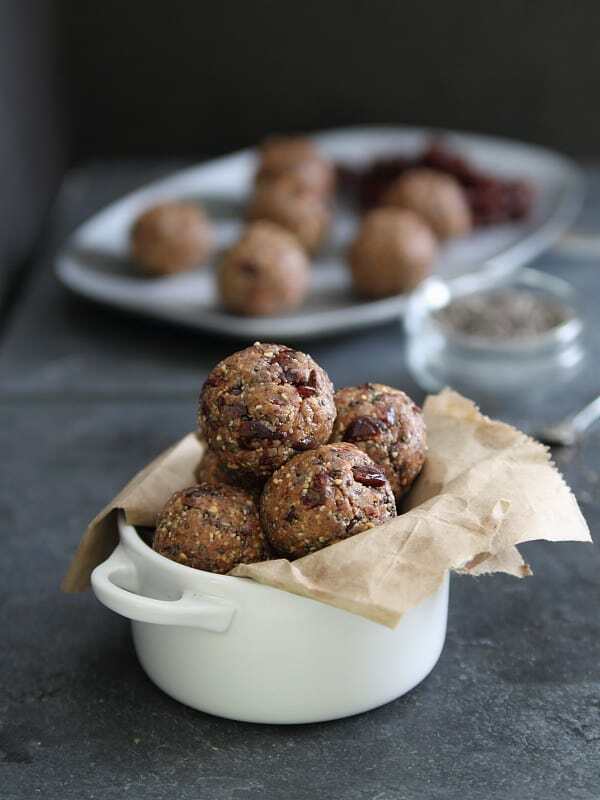 These chia cherry crunch bites are high in protein, full of omega-3s, grain and gluten free and give you a nice little energy boost from the dried cherries. The crunch comes from the iron rich cacao nibs which I love because it tricks my brain into thinking I’m eating chocolate. So from here on out, it’s back to the balls when it comes to snacking pre and post workout. Brownies be gone! Place the almonds, cashew meal, dates and protein powder in a food processor. Process for about 30 seconds until finely chopped and combined. Add the remaining ingredients except the cacao nibs and 1/4 cup of the dried cherries to the food processor. Process for about 1-2 minutes well combined and a dough balls starts to loosely form. Roughly chop the 1/4 cup of dried cherries and fold them and the cacao nibs into the mixture. Roll into balls (about the size of a golf ball). I have the same problem with throwing out food! So then I end up feeling like I need to eat all the bad stuff…luckily, I usually pawn most of it off on the hubby and his coworkers! But, yes, need to get over that! I have yet to try chia seeds, and seriously need to get on that! I love balls. I really wish my husband had the type of job where I could send him to work with food and coworkers would gobble it up. Not the case though unfortunately! That’s the thing, there’s no one to give it to! I don’t have coworkers and my husband doesn’t really have a job where they have a central place to eat and leave food. And making less of the stuff I don’t eat unfortunately just means less assignments and therefore less $. Tough call! It is a hard one! Any homeless centres near by? I give food to random neighbours!!! Chai is absolutely one of my favorite flavors! I love all the ingredients you have put together in these crunch bites! These “balls” look tasty. OK OK I couldn’t help myself either. They really do look like a good snack. These are some tasty looking balls! Ok, I’m really sorry. But, really, these look fabulous! Made these this morning! Very yummy :) And I love that they’ve got a good ratio of fat:protein:carbs. Yum! That looks wonderful! Love the ingredients in there! 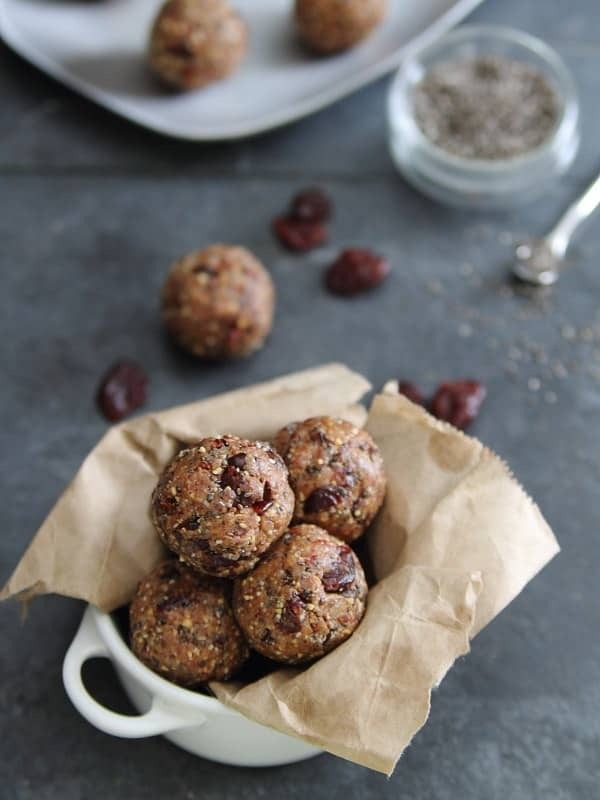 As I am in the tough part of my half marathon training cycle, I need lots of post run snacks, these would be perfect! Help me recovery quicker, and run faster! Nutrition is crucial to elite runners, you are helping! These would be great for traveling as well when eating well is a challenge! Pingback: Chia Recipes: Pudding, Drinks, Healthy Snacks And More | Everyfoodrecipes, cooking tips, and how-to food videos—all rated and reviewed by millions of home cooks,make the perfect birthday cake, or plan your next holiday dinner.